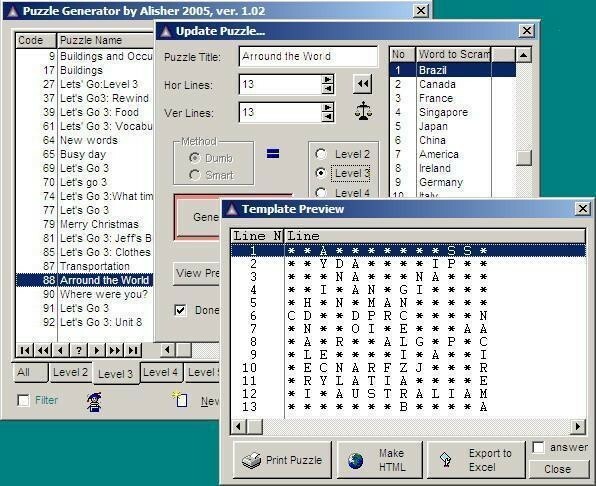 The puzzle generator software is an educational/teaching tool. It generates puzzles and other worksheets that could be used as a class activity. Puzzle Generator makes teachers' life easy. Puzzle Generator also includes a ready built-in puzzle collection so you won't need to type words. The puzzles could be any size, big or small. You can send them by email as an Excel or HTML format attachment or even create interactive puzzle games for web. The key feature of this program is that this program can generate printable worksheet and enormous size word search puzzles up to 100x100 and different shapes. The sample of such puzzle is available on my homepage. Puzzle Generator also includes a ready built-in puzzle collection so you won't need to type words anymore. However you still can add new words and if you already have a word lists it's possible to import them into puzzle database. Puzzle Generator has a lot of puzzle templates. By using the templates you can create new puzzles, export or import them to Excel and generate printable worksheets in html format. This program makes word matching worksheets too. In addition Puzzle generator has its own print preview window. Beside that, in addition to puzzle worksheets the program generates word matching worksheets too. Qweas is providing links to Puzzle Generator 2.0 as a courtesy, and makes no representations regarding Puzzle Generator or any other applications or any information related thereto. Any questions, complaints or claims regarding this application Puzzle Generator 2.0 must be directed to the appropriate software vendor. You may click the publisher link of Puzzle Generator on the top of this page to get more details about the vendor.